The bulk of Black's book details the ongoing business relationship between Watson's IBM and the emerging German regime headed byAdolf Hitler and his National Socialist German Workers Party (NSDAP). Hitler came to power in January 1933; on March 20 of that same year he established a concentration camp for political prisoners in the Bavarian town of Dachau, just outside the city of Munich. Repression against political opponents and the country's substantial ethnic Jewish population began at once. By April 1933, some 60,000 had been imprisoned. Despite the violent and repressive climate emerging in the new ultra-nationalist Germany, business relations between IBM and the Hitler regime continued uninterrupted in the face of broad international calls for an economic boycott. Indeed, Willy Heidinger, who remained in control of Dehomag, the 90%-owned German subsidiary of IBM, was an enthusiastic supporter of the Hitler regime. On April 12, 1933, the German government announced the plans to immediately conduct a long-delayed national census. The project was particularly important to the Nazis as a mechanism for the identification of Jews, Gypsies, and other ethnic groups deemed undesirable by the regime. Dehomag offered to actively assist the German government in its task of ethnic identification, concentrating first upon the 41 million residents of Prussia. This activity was not only countenanced by Thomas Watson and IBM in America, Black argues, but was actively encouraged and financially supported, with Watson himself traveling to Germany in October 1933 and the company ramping up its investment in its German subsidiary from 400,000 to 7,000,000 reichsmarks — about $1 million. This injection of American capital allowed Dehomag to purchase land in Berlin and to construct IBM's first factory in Germany, Black charges, thereby "tooling up for what it correctly saw as a massive financial relationship with the Hitler regime." 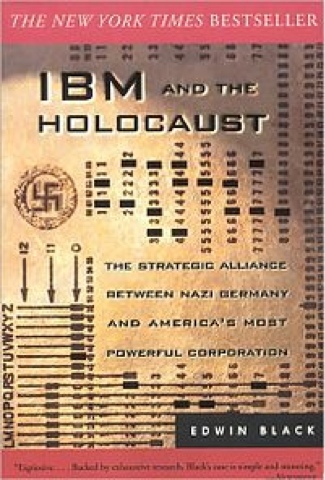 Black also asserts that a "secret deal" was made between Heidinger and Watson during the latter's visit to Germany which allowed Dehomag commercial powers outside of Germany, enabling the "now Nazified" company to "circumvent and supplant" various national subsidiaries and licensees by "soliciting and delivering punch card solution technology directly to IBM customers in those territories. "As a result, Nazi Germany soon became the second most important customer of IBM after the lucrative US market, Black notes. "Since the advent of the Third Reich, thousands of Jews nervously assumed they could hide from the Aryan clause. "But Jews could not hide from millions of punch cards thudding through Hollerith machines, comparing names across generations, address changes across regions, families trees and personal data across unending registries. It did not matter that the required forms or questionnaires were filled in by leaking pens or barely sharpened pencils, only that they were later tabulated and sorted by IBM's precision technology." On September 13, 1935, Hitler demanded the immediate implementation of a "Law for the Protection of German Blood" which deprived Jews of German citizenship and prohibited them from having sexual relations with or from marrying Aryans. Machine-tabulated census data greatly expanded the estimated number of Jews in Germany by identifying individuals with only one or a few Jewish ancestors. Previous estimates of 400,000 to 600,000 were abandoned for a new estimate of 2 million Jews in the nation of 65 million. Another German census was conducted on May 17, 1939, when 750,000 census takers conducted interviews with the country's 22 million households, and also millions of factories. The purpose of the census was to identify the number of Jews in Germany and its newly expanded territories and to precisely locate each individual so that the Jewish population could be effectively ghettoized.Ancestral lines had to be documented by each head of household as part of the national census, which dwarfed in size and detail the 1933 Prussian census. As the Nazi war machine spread occupied the nations of Europe, capitulation was followed by a census of the population of the subjugated nations, with an eye to the identification and isolation of Jews and Gypsies. For example, the September 1, 1939 invasion of Poland was followed by an October 14 order of the Special Operations unit of the German Secret Police for a full census of the Jewish population, information which supplemented published information from the 1931 general Polish census. These census operations were intimately intertwined with technology and cards supplied by IBM's German and new Polish subsidiaries, which were awarded specific sales territories in Poland by decision of the New York office following Germany's successful Blitzkrieg invasion. "Each person over the age of twelve was required to fill out census and registration in duplicate, and then was fingerprinted. Part of the form was stamped and returned as the person's new identification form. Without it, they would be shot. With it, they would be deported." Data generated by means of counting and alphabetization equipment supplied by IBM through its German and other national subsidiaries was instrumental in the efforts of the German government to concentrate and ultimately destroy ethnic Jewish populations across Europe, Black demonstrates. He also notes, in an understated aside, that fully half of IBM's German subsidiary's annual profit — RM 1.8 million — was suddenly generated in December 1939. Black also reports that every Nazi concentration camp maintained its own Hollerith Abteilung (Hollerith Department), assigned with keeping tabs on inmates through use of IBM's punchcard technology. In his book, Black charges that "without IBM's machinery, continuing upkeep and service, as well as the supply of punch cards, whether located on-site or off-site, Hitler's camps could have never managed the numbers they did. Each of the major concentration camps was assigned a Hollerith code number for paperwork purposes: Auschwitz — 001; Buchenwald— 002; Dachau — 003; Flossenbürg — 004; Gross-Rosen — 005; Herzogenbusch — 006; Mauthausen — 007; Natzweiler — 008;Neuengamme — 009; Ravensbrück — 010; Sachsenhausen — 011; and Stutthoff — 012. Upon arrival at the camps in 1943, incoming prisoners would be examined for fitness to work, physical information would be recorded on a medical record, names would be cross-checked with data from the Political Section to determine whether the prisoner was additionally wanted for political offenses.